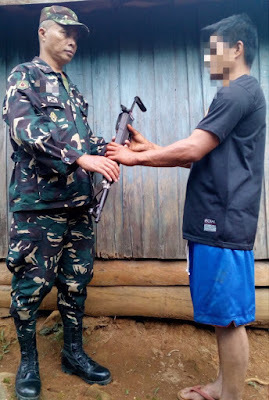 MATILBOG, Bukidnon – One CPP-NPA terrorist (CNT) surrenders to troops of 8th Infantry (DEPENDABLE) Battalion (8IB) at Sabangan Patrol Base, Brgy San Luis, Malitbog, Bukidnon, 4:30 AM, on May 7, 2018. 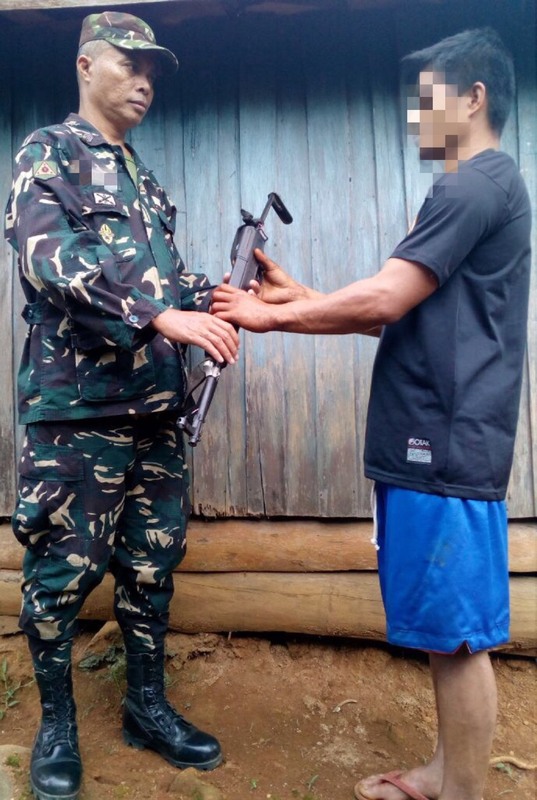 Surrenderee was identified as Anaclito Sanugan Sagula Jr. also known as (AKA) Jepy, 32 years old, a resident of Purok 1, Barangay Hagpa, Impasugong, Bukidnon. He brought along with him an AK47 rifle and three magazines loaded with 88 ammunition. “Apil ko atong grupo na naingkwentro sa Militar kadtong niaging adlaw sa Sitio Victory (I was with the NPA group during the encounter last May 4 at Sitio Victory),” Sagula admitted. Meanwhile, 8IB is coordinating with the local government unit of Malitbog and the tribal leaders for the needs of the surrenderee. “Sagula will undergo an interview. Further, we are coordinating with the local government of Malitbog and Bukidnon in order to process the psychosocial intervention from the provincial DSWD and the assistance of Comprehensive Integration Program (CLIP) from the Provincial DILG. Under the CLIP, a regular NPA surrenderee will receive immediate cash assistance of ₱15,000.00 and a livelihood assistance of ₱50,000.00. He will also receive a corresponding amount for the firearm he surrendered depending on the serviceability upon the evaluation of the CLIP Committee of Bukidnon.” Lieutenant Colonel Ronald Illana, Commanding Officer of 8th Infantry Battalion said. Troops are also exerting all efforts to locate the family and inform them of Sagula’s current status. "We will ensure that the family of Sagula will be informed of his whereabouts. I am very sure they wanted to see him. On the other hand, I congratulate the 8th Infantry Battalion on the continuous efforts exerted in their area of responsibility just to ensure that the Bukidnons will eventually experience the peace and development they long to achieve.” Brigadier General Eric Vinoya, Commander of the 403rd Infantry Brigade said. Major General Ronald Villanueva, Commander of 4th Infantry Division calls for the remaining members of CNTs in the mountains who are suffering due to the relentless efforts of the operating troops to lay down their arms. “I know that most NPA terrorists are planning to surrender, they are just waiting for the proper timing. There is a life aside from the life you are experiencing right now - away from hunger, fear, and intimidation. A life that is far more productive and happy with your family and loved ones at home. You still have a chance to come back to the folds of the government, and experience this life. We are waiting to assist you on your surrender.” Major General Ronald Villanueva, Commander of Army’s 4th Infantry Division said.